Potato salad is potato salad you might say. I’m here to tell you, my friends, that the little things make quite a difference. Enroute to Poland, we’ve stopped off in Sacile, Italy to visit friends, one of whom is Polish. As it turns out, they both have family visiting while we are in town. So our gracious hosts scrambled to make room for 8 in their apartment. What I’m sharing with you today is the large batch of Polish Potato Salad (Sałatka Jarzynowa) Mama Maria made for this housefull. You could certainly scale it down, but it’s so delicious, why would you? Making the potato salad in this family is a team effort. Maria is boiling the veggies, which Tata Zbigniew peels and dices ever so finely once they’fe cool. Our friend, Greg who was kind enough to share his mom’s recipe, tells me that this is something his family always has for Christmas Eve and Slywester (New Year’s Eve). The veg are cooked the day before, possible left on the balcony to cool over night, depending on the weather, and he will wake up to find his parents busy in the kitchen, chopping and assembling the next morning. I’ve noticed that so many Polish recipes, have you boiling the potatoes in their skins which seemed unusual to me. In the past, when I’ve made potato salad, I peeled and diced before boiling? Am I the only one? So I had to ask, why cook the potatoes in the skin? Actually all of the boiled veggies are unpeeled. The answer was that the peel adds flavor (and most likely vitamins), and I have to agree. The flavor is very good. My own observation is that the texture is different, more consistent, and pristine. The links below are Amazon affiliate links which means if you make a purchase, they sent me a few cents to help support this site. 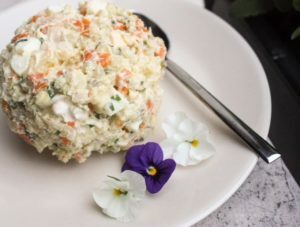 As eight hungry people have been noshing on Polish Potato Salad (Sałatka Jarzynowa), I’ve picked up some serving suggestions. Greg loves to eat it on toast, and Maria’s creative suggestion, which was fabulous, a small slice of a good bread, spread with butter, top with a thin slice of deli ham, put potato salad on half of the ham, fold the other half over the top, essentially making a ham and potato salad taco (on top of buttered bread). Yum-o! Pyszne! 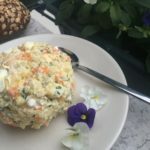 So whether your game nights are all English or involve more than one language, there’s no need to limit yourselves; this sałatka is so much for that a cookout side dish. 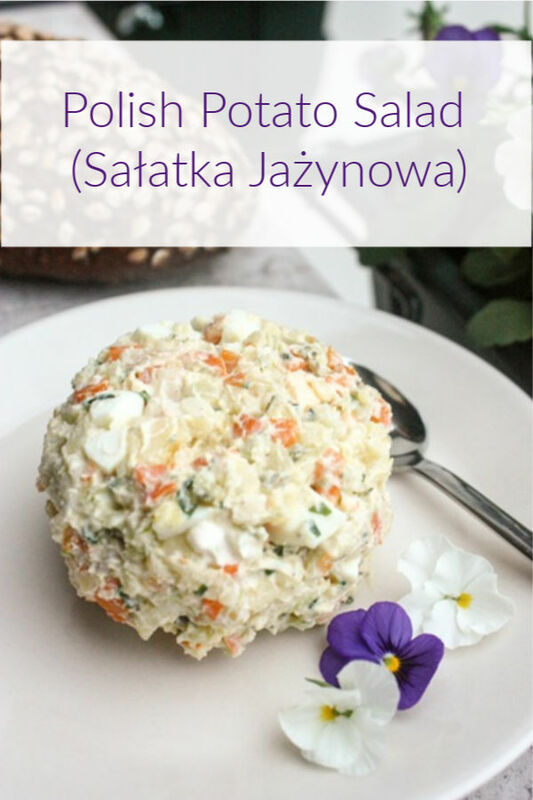 Let’s hear your creative ideas for Polish Potato Salad (Sałatka Jarzynowa). 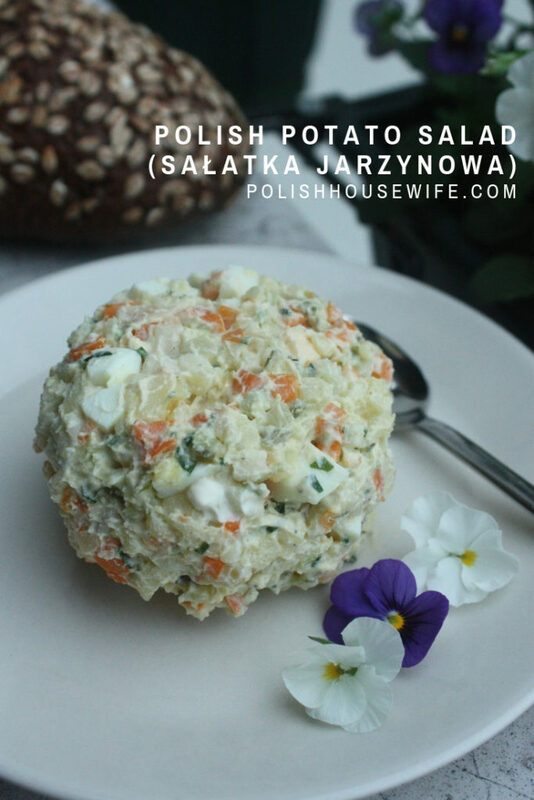 A Polish potato salad that is full of flavor! Thank you, Kamila; I’ll fix it. Our family recipe does not include vegetables . we only use celery and onion. Will try soon. I declared this as the best potato salad I have ever had! It is great and peaked right after preparation. Next time I will not create such a fine grate with the pickles, as on day 2 the sour flavor had dissipated and was more sweet than I would have liked. .But on day one – wow! This will be my go-to potato salad.. Thanks for taking time to comment, Diane. I’m delighted to hear that you enjoyed it! I will be trying this, as I’m from a Polish family. Don’t recall them ever making it this way…sounds so good. We loved it, Betty. I hope you will too! Thank you so so much for this website and this polish potato salad. This is my daughters all time favourite. Every time I go to the polish store here in St. Catharines Ontario where I live I have to always buy 2 containers of this. Now that I have come across you site, I am exited to start making different polish things for my family. I lose my mother when I was 13trs old and I have be collecting different polish recipes than what is in my mother’s own cook book. I miss a lot due to a lot of recipes were in her head. So thank you so much again for your site. Thank you for your kind words, Robin. I’m glad I can connect you with some favorite family memories. Hugs!